Update: We tossed in a new screenshot up there that shows two things of importance: 1. That it’s a 4G LTE phone. 2. That it has global capabilities, just like the Incredible 2. Talk about an added bonus, especially with the possibility that the Galaxy Nexus won’t be. We were starting to wonder if the HTC Vigor aka Rezound aka Incredible HD had been axed or severely delayed with the two big announcements on the way from Motorola and Samsung/Google. It had essentially disappeared from all chatter around these parts and from our sources as well. Today, it’s back! And the name Rezound that we first reported on back in September has pretty much been confirmed. 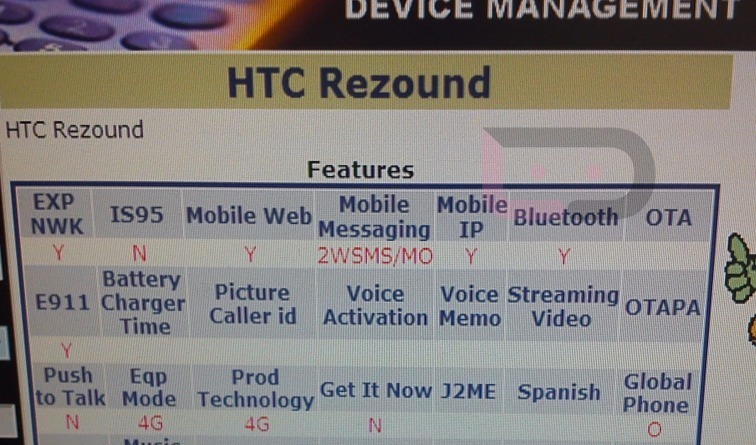 It’s in Verizon’s Device Management system as the Rezound, our sources are now calling it the Rezound, and well, we are expecting that to be plastered on retail packaging. Whether you are a fan of the name or not, you will be a fan of the phone itself. Dual-core processor, HD screen, Beats integration, and LTE should make this device a true beast. I know it has a tough task going up against the Galaxy Nexus, but that doesn’t mean the phone isn’t above top tier. Still no word on a release date. The last roadmap we saw showed October 20 which is next Thursday. Sort of doubting that we will see it then with the RAZR and G-Nex about to get all sorts of love.